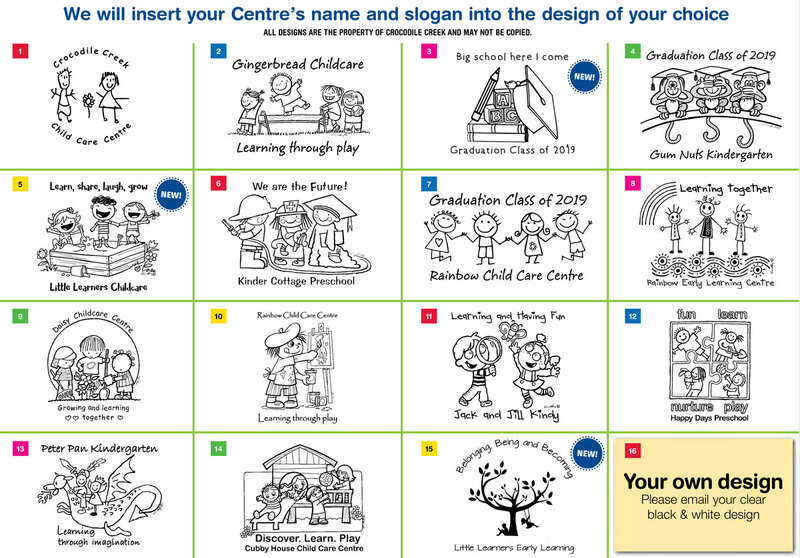 CHILD CARE CENTRE SHIRTS promote your centre and help create a good image. They feature your Centre’s name & picture on the front. Select from either Bucket, Surf or Legionnaire Hats and order a minimum of 15 hats in any one colour and style. Delivery takes just 2-3 weeks and it’s free. Prices start from as little as $15 which includes GST and delivery. There are no hidden costs! Staff shirts are a must in many Centres because they make staff easy to identify and they help promote their professional image. Staff shirts solve the problem of what to wear. Children’s shirts are popular with children and parents alike. Children love to wear them and identify with their Preschool & friends. The shirts will be a gorgeous memento when they leave Kindy. Please send full payment with the order. Shirts will be delivered in 2 – 3 weeks! Feel free to download our Parents Take Home Form which you can distribute to parents and staff to collect their orders.